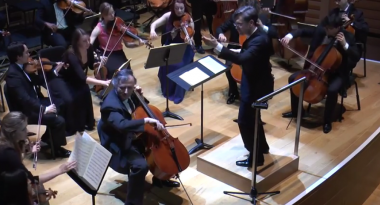 Please visit our YouTube channel for more videos from our concerts. 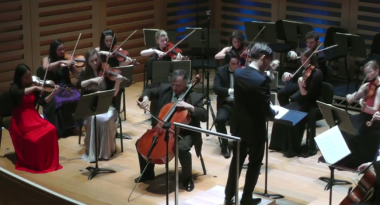 The London Chamber Music Society hosted the Firebird Orchestra on Sunday 8th May 2016 at Kings Place, London. 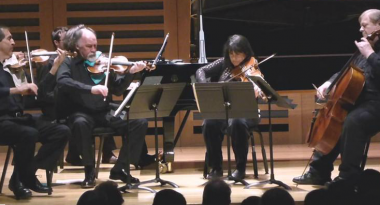 The London Chamber Music Society hosted the Trio Van Beethoven on Sunday 26th April 2015 at Kings Place, London. 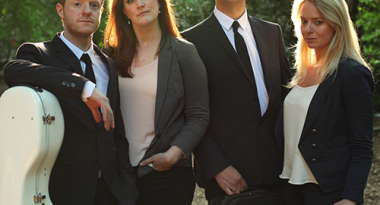 The London Chamber Music Society hosted the Badke Quartet on Sunday 4th May 2014 at Kings Place, London. 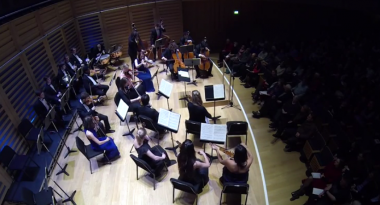 The London Chamber Music Society hosted the Firebird Orchestra on Sunday 8th February 2015 at Kings Place, London. 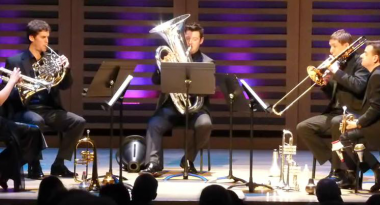 The London Chamber Music Society hosted the Fine Arts Brass Ensemble (Angela Wheelan, trumpet, Adrian Uren, horn, Les Neish, tuba, Ed Jones, trombone, and Simon Lenton, trumpet) on Sunday 17th March 2013 at Kings Place, London. 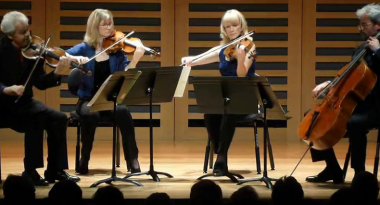 The Barbirolli Quartet with Janet Hilton (clarinet) played Brahms-Clarinet Quintet in B min Op.115, part of 3rd mov (3.5min) 'Andantino- Presto non assai, ma con sentimento' for the London Chamber Music Society on 25 November 2012 at Kings Place, London. 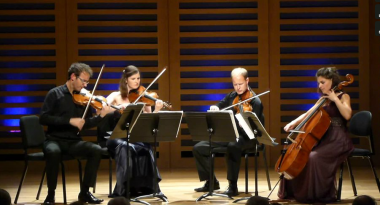 The Carducci Quartet, Matthew Denton (violin), Michelle Fleming (violin), Eoin Schmidt-Martin (viola) and Emma Denton (cello) played Mendelssohn's String Quartet No.6 in F minor, Op.80, 1st mov 'Allegro assai - Presto' for the London Chamber Music Society on November 4th 2012 at Kings Place. 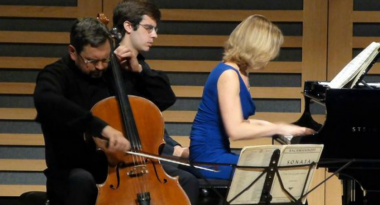 Leonid Gorokhov (cello) & Olga Vinokur (piano) played Rachmaninov: Cello Sonata in G minor Op.19, 4th mov. 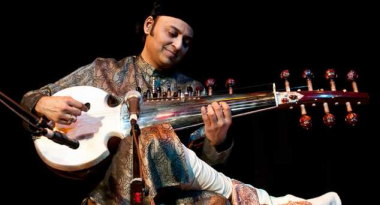 Allegro mosso (5min). 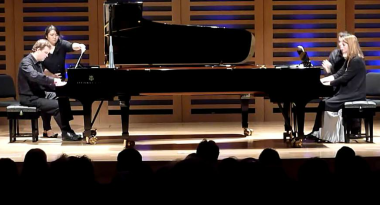 for the London Chamber Music Society Series at Kings Place, on Sunday, 28th October. 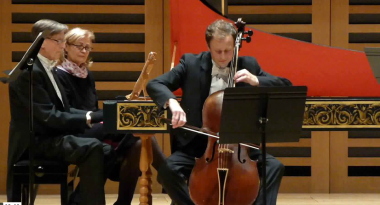 Concertante of London, Sir Nicholas Jackson, harpsicord, and Nick Stringfellow, baroque cello, played for the London Chamber Music Society Series at Kings Place, on Sunday, 21st October. 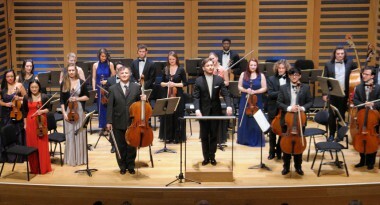 for the London Chamber Music Society at Kings Place on Sunday, 14 October 2012. 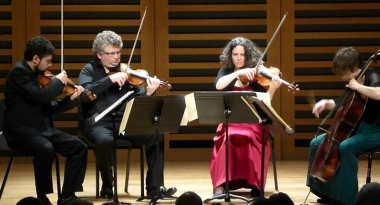 The Emperor Quartet, Martin Burgess (violin), Clare Hayes (violin), Fiona Bonds (viola), William Schofield (cello), played Benjamin Britten: String Quartet No.1 in D Op.25 (3.5min clip) on Sunday, 7th October 2012 at Kings Place. 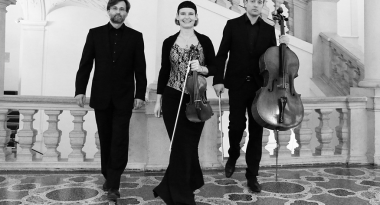 The Allegri Quartet, Ofer Falk, 1st violin, Rafael Todes, 2nd violin, Dorothea Vogel, viola, and Vanessa Lucas-Smith, cello, played Beethoven's String Quartet in F, Op 135 (1826) IV. 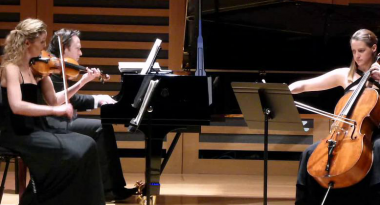 Der schwer gefasste Entschluss: Grave ma non troppo tratto - Allegro - for the London Chamber Music Society at Kings Place, London on 22nd April 2012. 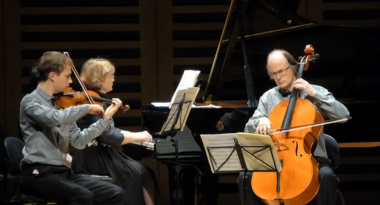 The Aquinas Piano Trio, Ruth Rogers (violin), Katherine Jenkinson (cello), Martin Cousin (piano), played Shostakovich's Piano Trio No.1 in C minor, Op.8 'Poème' on April 15th 2012 for the London Chamber Music Society at Kings Place, London. 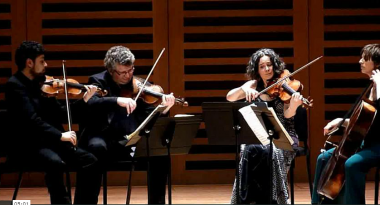 The Chilingirian Quartet with Sofya Gulyak (piano) play 7 min of Robert Schumann's Piano Quintet in E flat, Op.44 (1842) - I. Allegro brillante - in a concert for the London Chamber Music Society at Kings Place, London on April 1st 2012.
played by Vicky Yannoula & Jacob Fichert Piano Duo in a concert for the London Chamber Music Society at Kings Place, London on March 25th 2012. 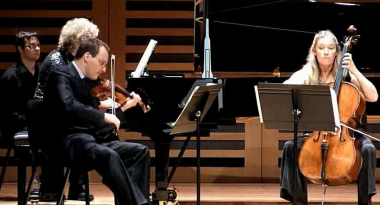 Johannes Brahms: Trio in E flat for horn, violin and piano, Op.40 - Finale - IV. 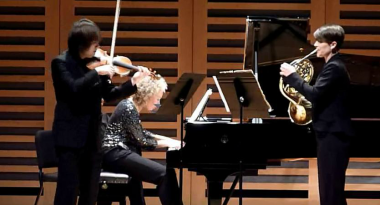 Allegro con brio - (6min) played by Frances Angell (piano), Tadasuka Iijiama (violin) and Sarah Maxwell (horn) for the London Chamber Music Society at Kings Place on March 18th 2012. 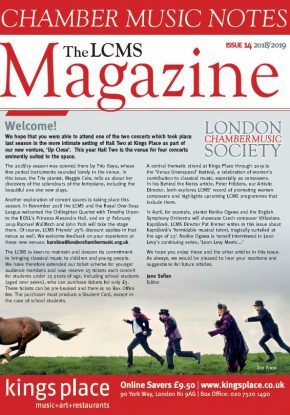 Tadasuka and Sarah are students at the Trinity Laban Conservatoire, London. 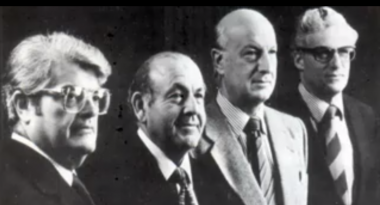 A 7 min clip from Shostakovich: Piano Trio No. 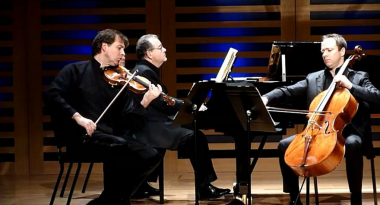 2 in E minor Op.67, played by the Shaham-Erez-Wallfisch Piano Trio at a concert for the London Chamber Music Society at Kings Place, London on February 19th 2012. 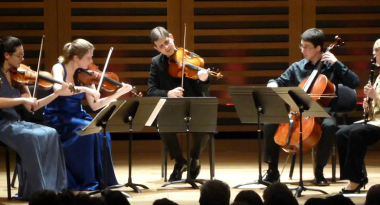 The Allegri Quartet, Ofer Falk, violin, Rafael Todes, violin, Dorothea Vogel, viola, and Vanessa Lucas-Smith, cello playing Beethoven: String Quartet in A minor Op.132 - Allegro appassionato Presto at a concert for The London Chamber Music Society at Kings Place, London, on Sunday, 12th February 2012. 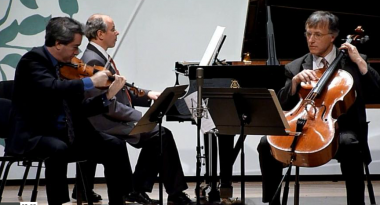 Felix Mendelssohn Bartholdy - Piano Trio No.1 in D minor, Op.49 (1839) - 4. 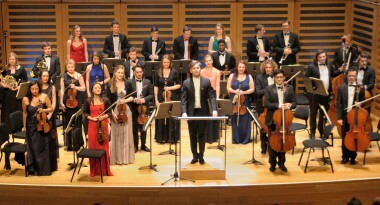 Finale: Allegro assai appassionato, played by members of the Turner Ensemble in a concert on 5 February 2012 for the London Chamber Music Society at Kings Place, London. 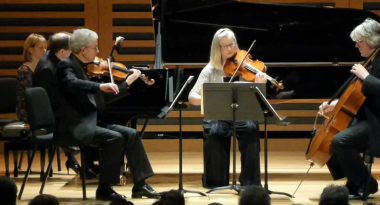 Frances Angell, piano, Jan Schmolck, violin and Sally Pendlebury, cello. 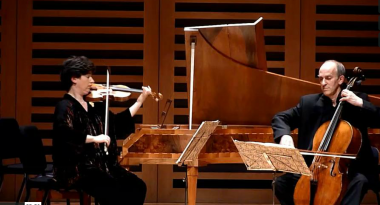 This rarely heard Duetto was played by Kati Debretzeni, violin, and Sebastian Comberti, cello, of the Goya Trio at the Kings Place concert for the London Chamber Music Society on January 29th 2012. 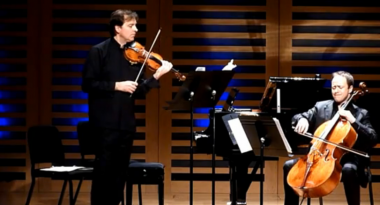 4 minutes from the 1st movement 'Allegro' played by Philippe Graffin, violin, Henri Demarquette, cello and Daniel Blumenthal, piano in a concert for the London Chamber Music Society, given at Kings Place on January 15th 2012. 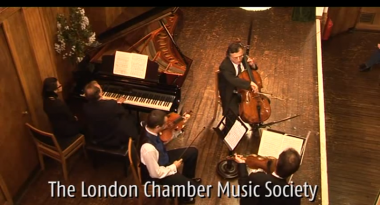 This video (in two parts) on the London Chamber Music Society, discusses its history and origins, which can be traced back to London concert life in the 1870s. 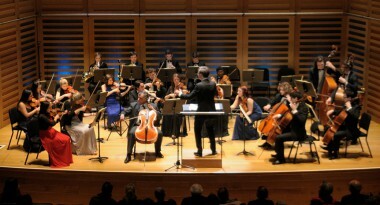 Concerts are held every Sunday at 18:30 from October to May at Kings Place.